Were $153.00 SALE $91.00 brown oilskin tartan lining Limited stock available Australian made Excellent for casual wear or work Collar can be worn turned up to protect neck from sun or folded down Zip up front concealed beneath a clip-stud fastened storm flap 2 large expandable pockets with pocket flaps secured with clip studs 2 inside pockets SIZE 3XS 2XS XS S M L ..
Flexseam caps stretch on the seams to comfortably grip your head. We have purchased hundreds of excellent quality caps that we are selling for only $5.50 each. There is nothing wrong with them, just one of our suppliers wanting to clear their stock. Made from heavyweight brushed fabric in wool / polyester blend, they hold their shape and are very durable. Flexifit style (stretch to fit head comfortably) with full back and curved brim. Sizes small, medium & large. Photo shows the colour range available yellow, light orange, dark orange, dark green, navy, royal blu..
Like a flat brim today, a curved brim tomorrow? Then this is the cap for you. We have purchased hundreds of excellent quality caps that we are selling for only $5.50 each. There is nothing wrong with them, just one of our suppliers wanting to clear their stock. Made from heavyweight brushed fabric in wool / polyester blend, they hold their shape and are very durable. Available in 6 sizes, these caps have a full back and a flexible brim that you can shape to suit your style. Photo shows the colour range available dark green, royal blue, navy, maroon. ***** Note th..
Buying a gift? Not sure what size, style or colour to get? 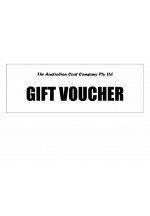 Give a GIFT VOUCHER then you know they will be happy with your gift. Available in $25.00 increments. Our GIFT VOUCHERS do not have an expiry date. 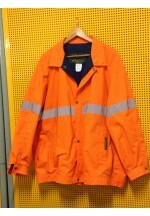 ..
1 only size LARGE This jacket is made in Australia by us for one of the mines. 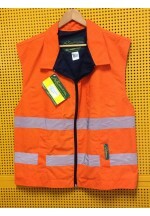 It is hi-viz orange & navy with 2 rounds of silver reflective tape on body & 1 round on sleeves. Lining is good quality navy cotton flannelette for added warmth. Size = Large Comfortable, multi-purpose jacket Zip up front covered by velcro fastened flap 2 chest pockets with velcro fastening pocket flaps 2 side handwarmer pockets Waistband Velcro fastening cuffs on sleeves 1 large internal pockets ..
1 only size XLARGE This jacket is made in Australia by us. It is hi-viz orange with 1 round of silver reflective tape on body & 1 round on sleeves. Lining is good quality navy cotton flannelette for added warmth. Size = XLarge Comfortable, multi-purpose jacket Zip up front covered by stud fastened flap 2 side handwarmer pockets Waistband Adjustable stud fastening cuffs on sleeves 2 large internal pockets It is made from Durapel which is 100% cotton fabric impregnated with a type ..
1 only, size SMALL This coat is made in Australia by us. 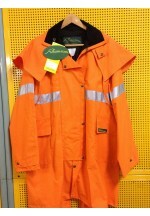 It is hi-viz orange Durapel. Lining is good quality black cotton. Collar is black corduroy. Size = Small Comfortable, multi-purpose knee length coat Stud clip fastenings up front covered by stud clip fastened flap 2 large pockets with pocket flaps Cape around shoulders provides added protection from wet weather Adjustable stud fastening tabs at wrist on sleeves 1 large internal pocket It is made from Durapel which is 100% c..
1 only size LARGE tall fit. 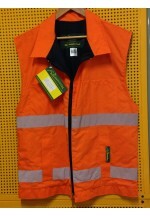 This vest is made in Australia by us. It is hi-viz orange with 2 rounds of silver reflective tape. Lining is good quality navy cotton drill. 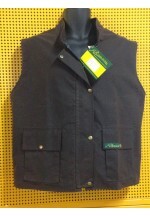 Size = Large Tall fit - centre front length 64cm Comfortable, multi-purpose vest Zip up front 2 chest pockets with divisions for pen 2 side handwarmer pockets Waistband 2 large internal pockets It is made from Durapel which is 100% cotton fabric impregnated with a type of Teflon to make it repel water and ..
1 only size LARGE This vest is made in Australia by us. It is hi-viz orange with 2 rounds of silver reflective tape. 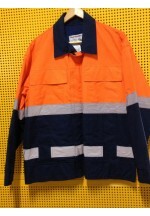 Lining is good quality navy cotton drill. Size = Large Comfortable, multi-purpose vest Zip up front 2 chest pockets with divisions for pen 2 side handwarmer pockets Waistband 2 large internal pockets It is made from Durapel which is 100% cotton fabric impregnated with a type of Teflon to make it repel water and grease. Durapel is extremely durable with thes..